The special feature of a machine producing napkin is the very high production speeds (>1000 napkins / min). 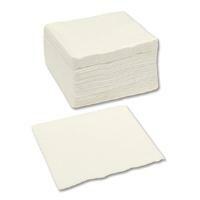 High speed production needs a very fast napkin storage system. For this reason, high-end controller and servo systems are installed. So both high-speed production and the accuracy that required by the system is achieved. A measuring system separates the napkins in packages, servos help separation and storage in special containers. This is a continuous flow process that requires precise movements and very demanding production times.